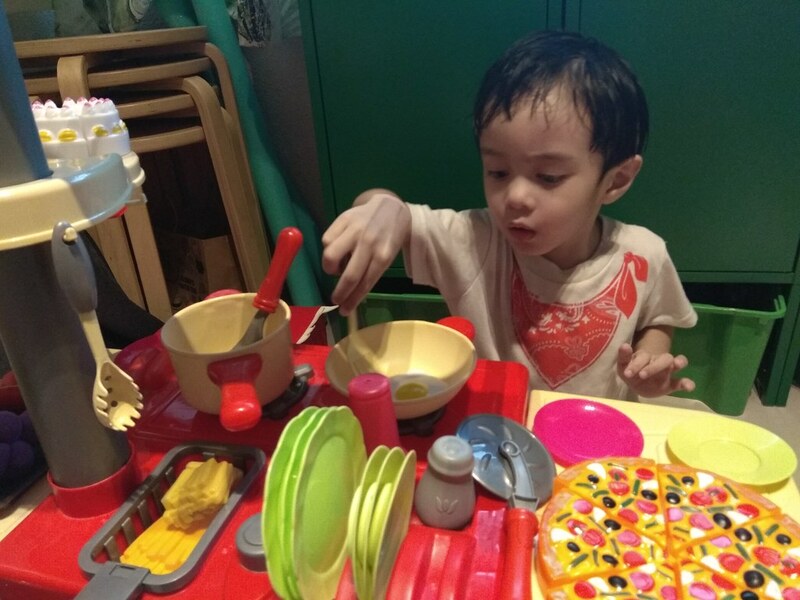 Like all kids, my son Arif loves to play, but as a kid on the spectrum, he has trouble with pretend and imaginative play. 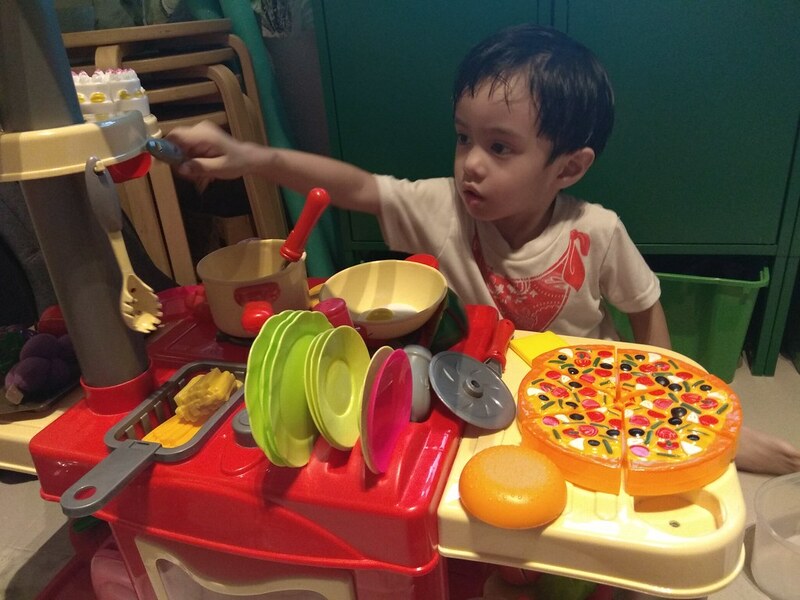 A few months back, his uncle got him a play kitchen, but Arif has taken a long time to actually understand how to play with it. This is because pretend play is difficult for children with autism. They lack imitation, symbolic play, social, communication and joint attention skills. 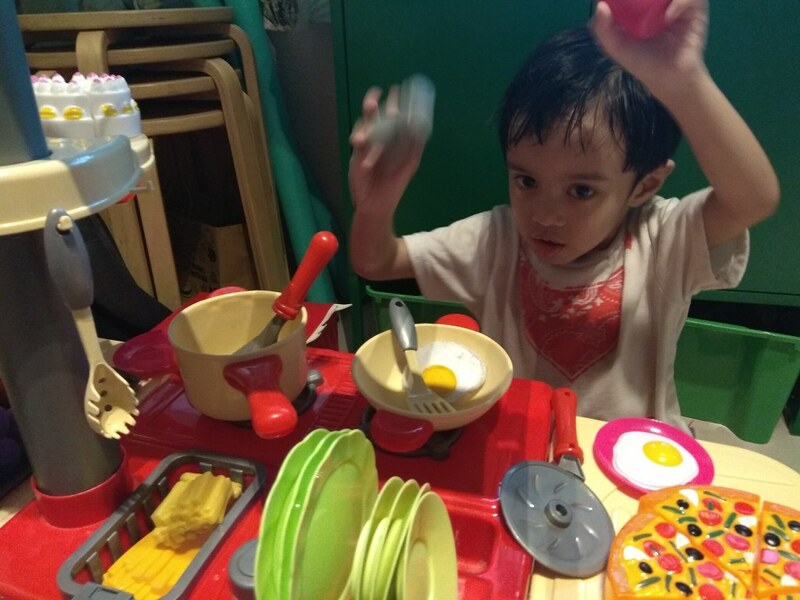 In the beginning, Arif would just take the play kitchen apart (over and over) and smash things around. Once or twice, he would take a cup and pretend to drink from it, but that's about it. He would take little interest in me being near him. 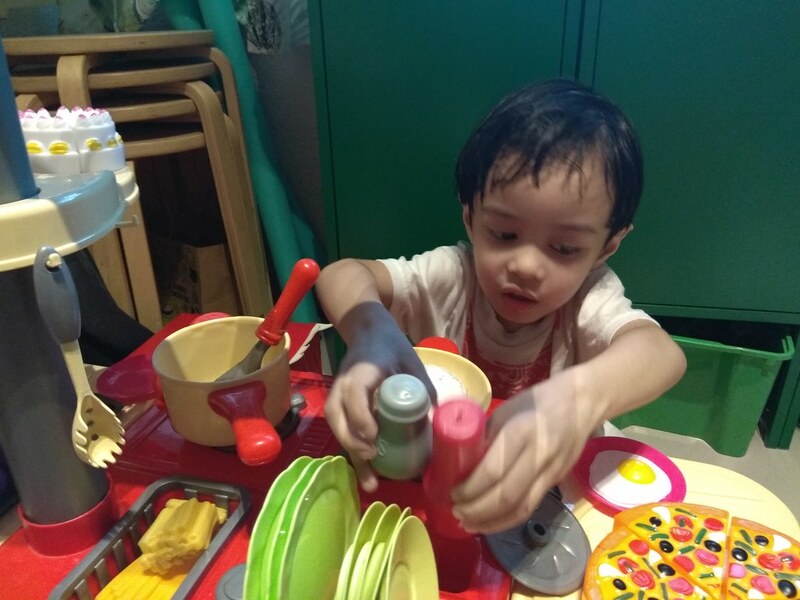 He did not really understand what all the food, utensils and stove were about. But I never gave up on showing him how to play. 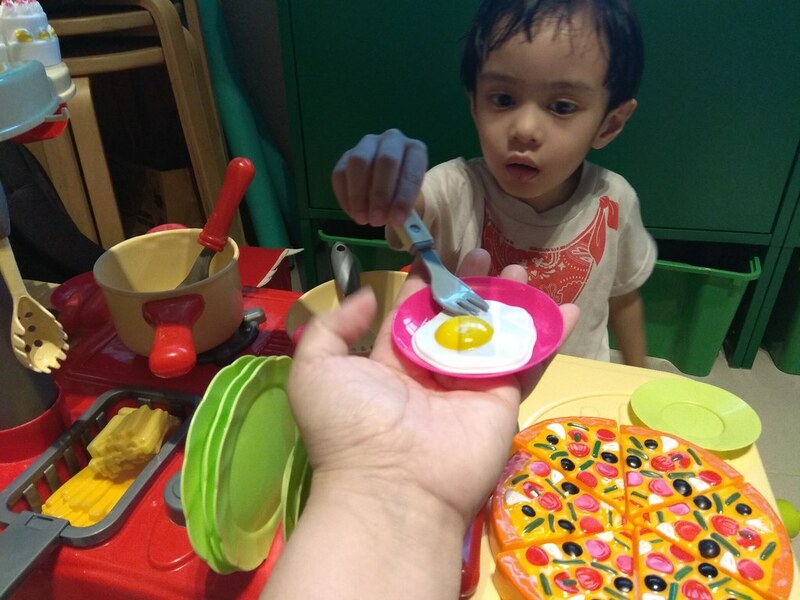 So you can imagine how excited I was yesterday, when Arif took a spatula, fried an egg 🍳, seasoned it, put it on a plate, served it to me and handed me a fork! He enjoyed this so much, he did it several times. Want to understand why kids with autism play differently? Check out this article. 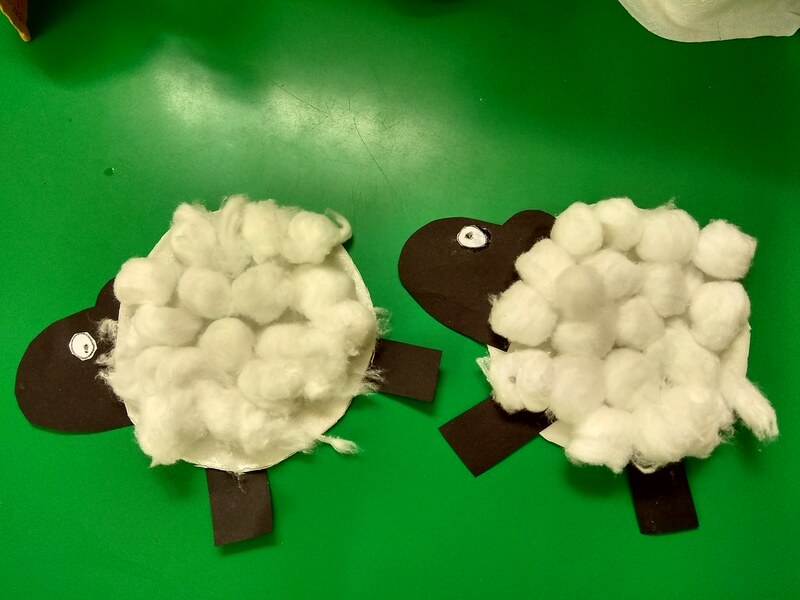 OBSTACLE COURSES & SHEEP... AT A PLAYGROUP? 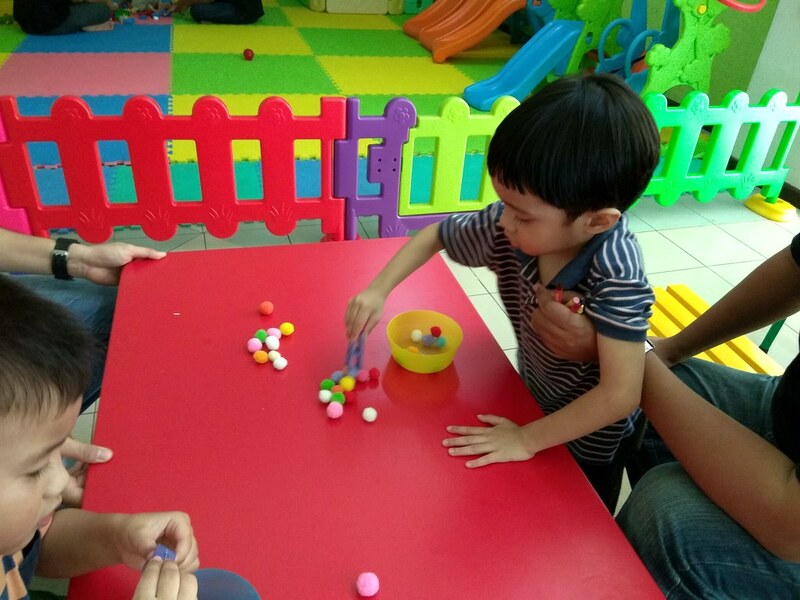 Our fourth KAMI Playgroup session was held on 2 December 2017. Check out our activities! 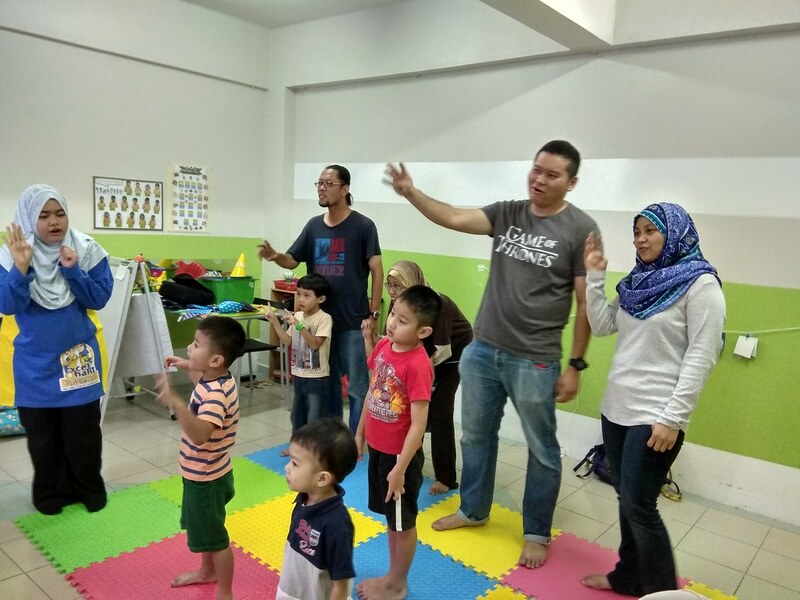 Summary: Led by Teacher Ami, and with help from parents, the children did action songs. 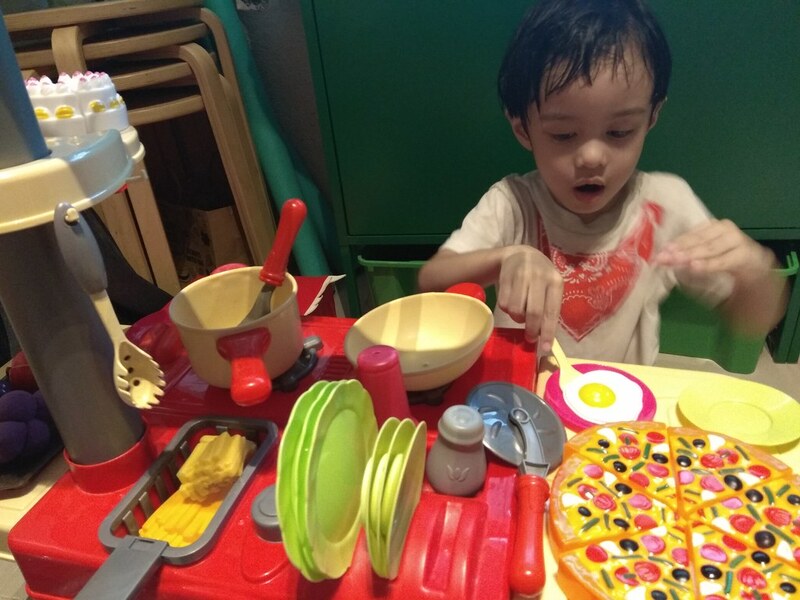 Summary: For this indoor play session, we did two activities. The first was a core strengthening exercise called the wheelbarrow. For the second activity, we did another obstacle course. This time the children did a picture-matching activity while completing the course, which consisted of zig zag line, trampoline and rings. 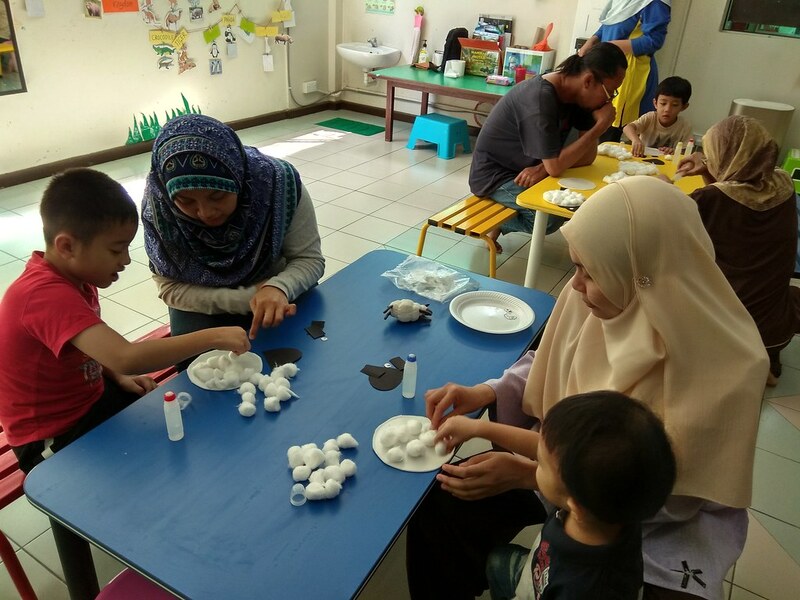 Summary: For this week's arts and crafts session, which was led by Puan Adline, the children worked with cotton balls, coloured paper and glue to create sheep. We did the session in the area outside the classroom for a change. Some of the children completed their work early, so we gave them some pom pom balls and clothes pins for extra fine motor exercise. At around 12.40 pm, we started cleaning up the area with help from the children. Then we sang the Goodbye Song and dispersed. It was another smooth session, the children seem more settled down now. Arif was not so keen on taking part in some of the earlier activities, but all the kids enjoyed the obstacle course and arts and crafts session. Sometimes, when you're a freelance writer/ editor, you have the pleasure of working on so many different projects that you don't always get to stay updated on the progress of those publications. This is one of those instances. 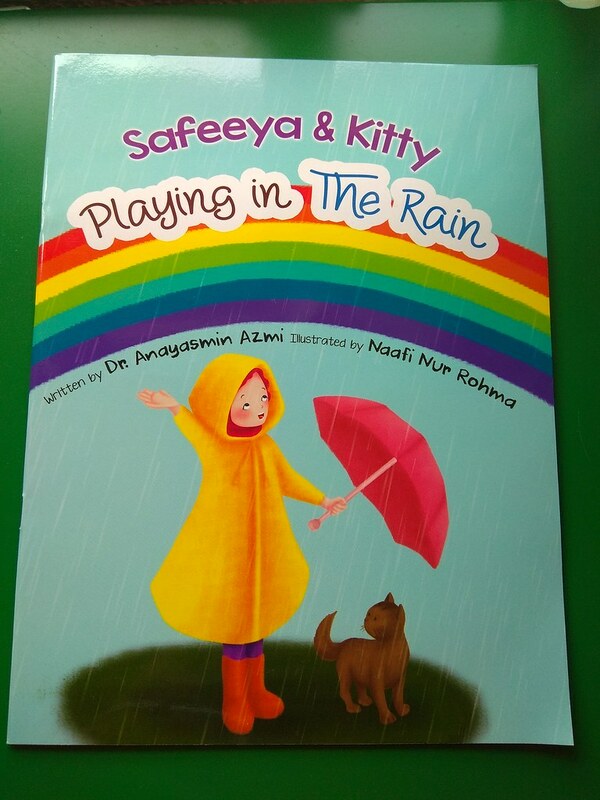 A few years ago, I met a doctor/ author named Dr Anayasmin Azmi online, and we had the chance to work together on some of the children's books she had written. 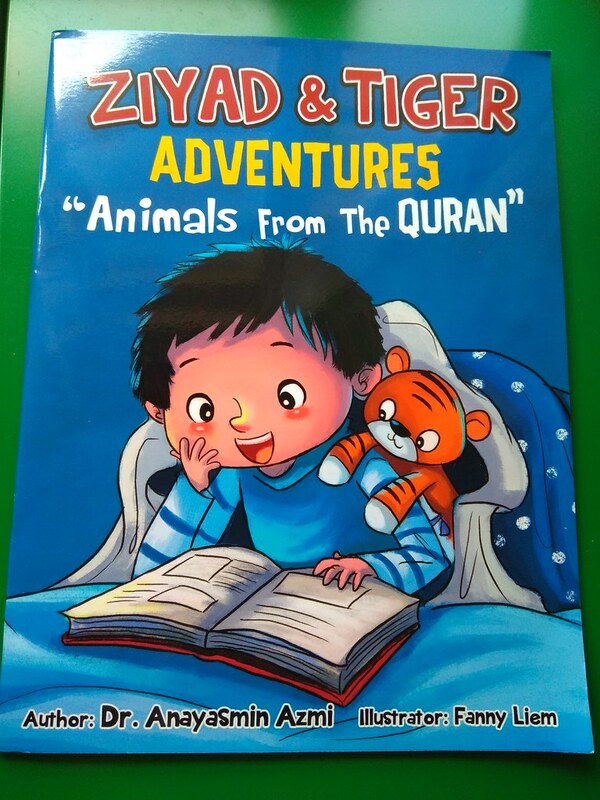 They were charming tales with valuable lessons in Islamic teachings, and I thought they were really unique. 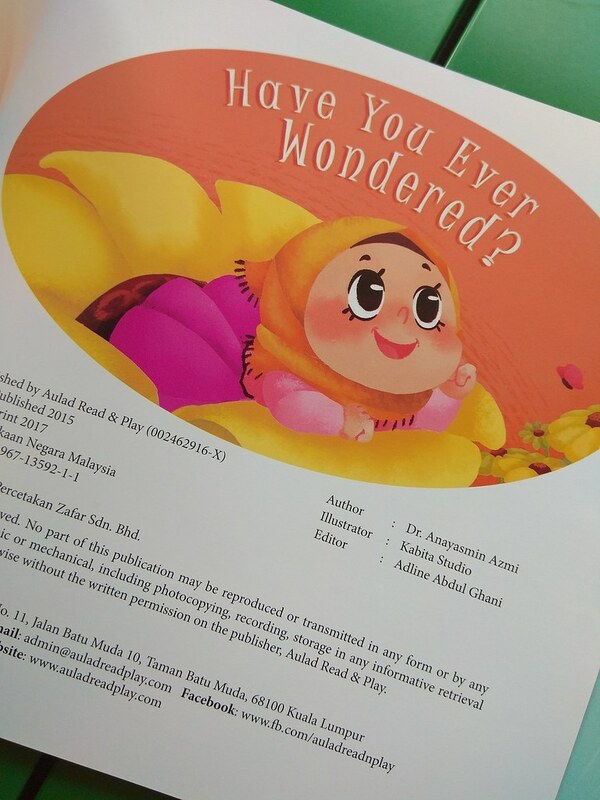 It has been several years since I first read the stories, but I still love them, and the wonderful illustrations really help bring everything to life :) Alhamdulillah I had the chance to work on these children's books, I hope I can work on more in the future. 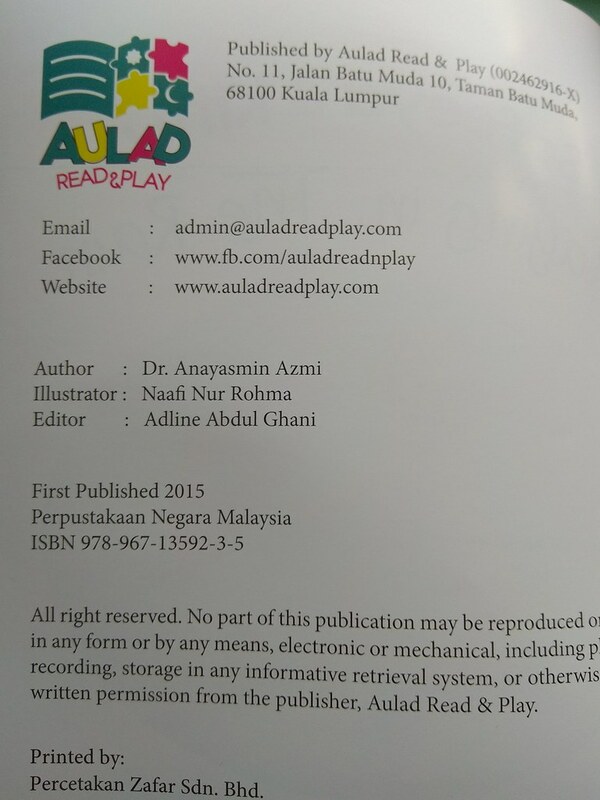 If you're interested to get these titles for your children, do head on over to Aulad Read and Play. They have a fascinating selection of other books as well. As usual, parents and chidren sat in a circle and we began the day with Salam, doa Alfatihah and a simple zikir for the children. After our warm up, we conducted a gross motor activity. We built an Obstacle Course using chairs, a bench, a tunnel, spoons and plastic eggs. The children took turns to make it through the obstacle course, take an egg with a spoon and put it into the egg carton. This was repeated several times to music. First go through the tunnel, then walk over the chairs, then pick up a plastic egg with a spoon and walk on the bench, and finally put the egg into the carton. Arif carrying a plastic egg with a spoon on the bench. The children arranged their egg into the egg carton at the end of the obstacle course. 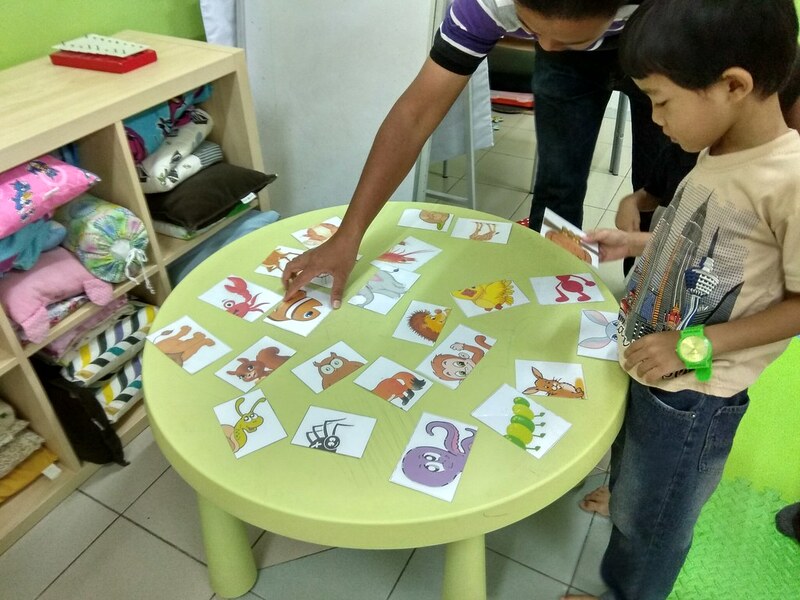 For the second activity, we tackled fine motor by doing a colour sorting exercise. The older children used colourful pom poms and jelly trays, while Arif used red and yellow plastic coins with clear plastic cups. The older children separated pom poms according to their parents' instructions. For this week's table task, the children worked with glitter and glue to create a shape. We provided a stencil for younger children like Arif to use. For this session, we prepared a star template, glue and glitter. Arif rubbing the glitter on with his fingers. Messy but fun! And last but not least, we cleaned up and sang a goodbye song. It was a smooth session from beginning to end. and like last week, the children seemed to particularly enjoyed the obstacle course, table task and arts and crafts sessions. Arif seemed to have a great time, and did very well in the colour sorting activity. He was also very particular in lining the pieces up inside the cups. 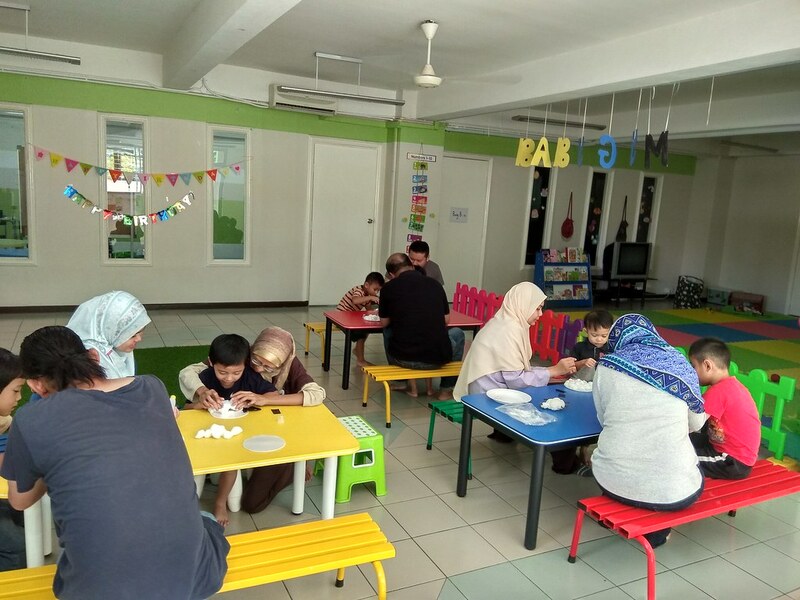 Interested to find out more about KAMI Playgroup @ Masjid Kg Tunku, volunteer or make a donation? Please don't hesitate to drop me an email at adline76@yahoo.co.uk. 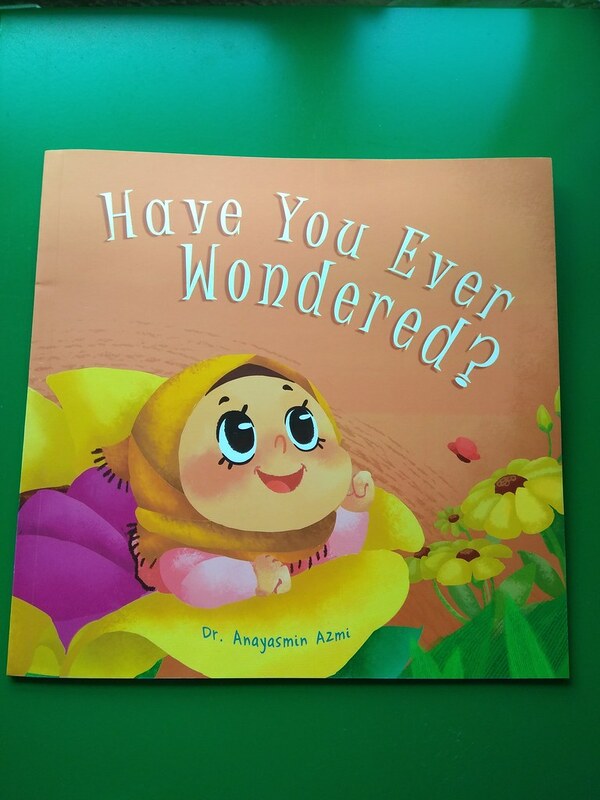 As usual, we started our session with doa and zikir, to seek blessings from Allah SWT and to calm and activate the children's minds. The doa is followed by action songs, which is intended as a warm up activity for the children. Among the songs we did actions to was "One little finger." Everyone singing and doing the actions to One Little Finger. In our first indoor play activity, we were paired up and sat opposite each other. The parents/ children then passed bean bags to their partner, back and forth. This activity encourages joint attention and coordination. Throwing bean bags may look easy to us, but children with ASD might find it difficult to do. For the second activity, we set up a simple Obstacle Course using chairs, a balance beam, a bench and plastic buckets. The children took turns to make it through the obstacle course and drop a bean bag in the plastic bucket. This was repeated several times to music. 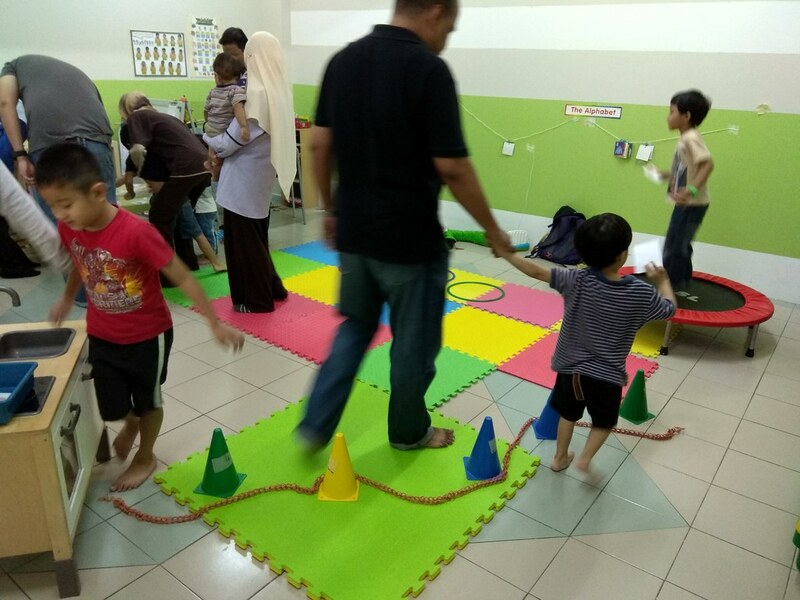 Parents helped their children with balance and to navigate the obstacle course. 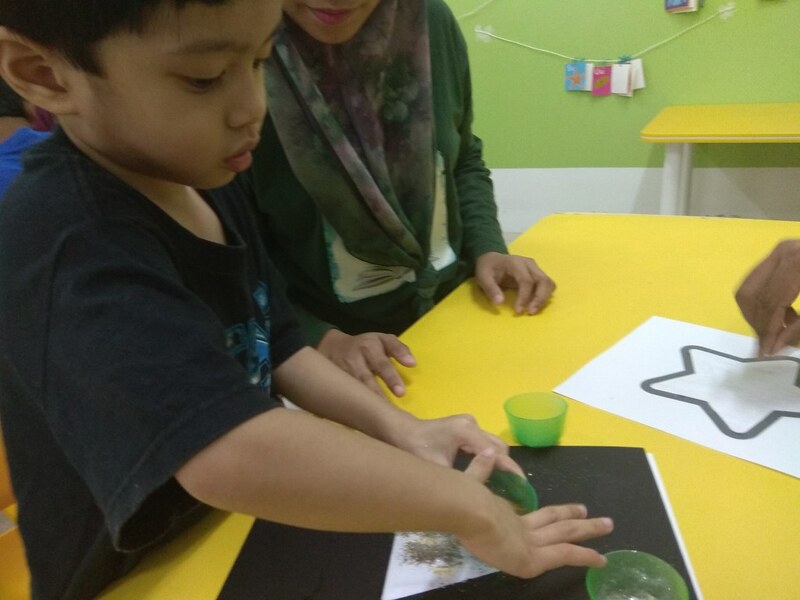 For this week's table task and art activity, we did Vegetable Printing using potatoes and lady's fingers. I cut some patterns in the potatoes to make them more interesting. The children were given a drawing block, vegetable blocks and paint. This simple activity provided the children a sensory experience, as well as encouraged their hand coordination and control. 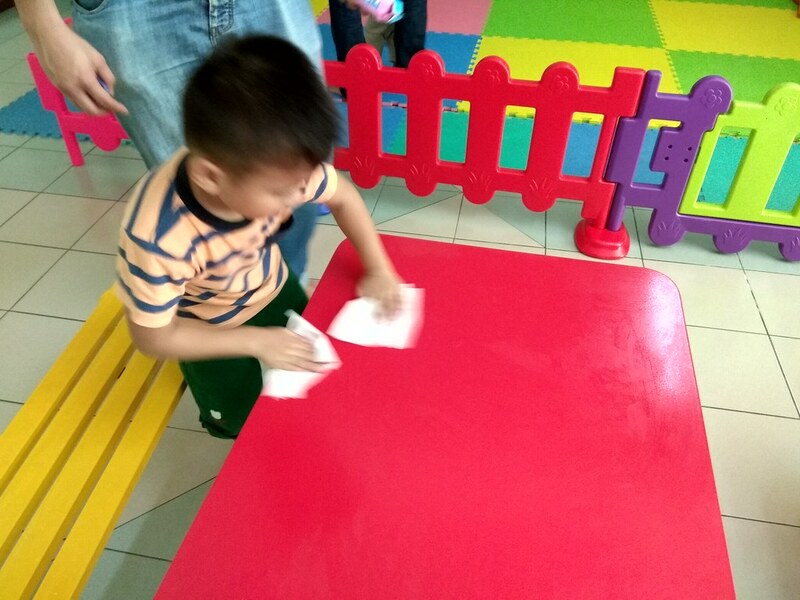 The children enjoyed wiping the tables down at the end of the session. The Goodbye song is another opportunity for action and movement. Here are some of the children's vegetable printing creations! 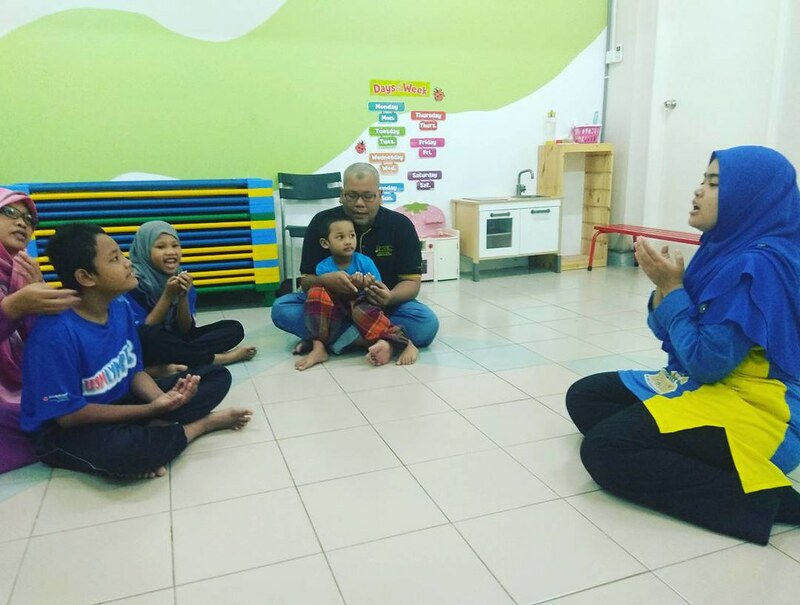 Arif found it difficult to settle down and participate in group activities like music and movement, as well as the Bean Bag Pass. He is usually quite restless during these activities, preferring instead to just walk around the room. Thankfully, he doesn't try to leave the room. However, he was able to participate in other activities, like the obstacle course. He also seems to enjoy table tasks the most, particularly the arts and crafts sessions. 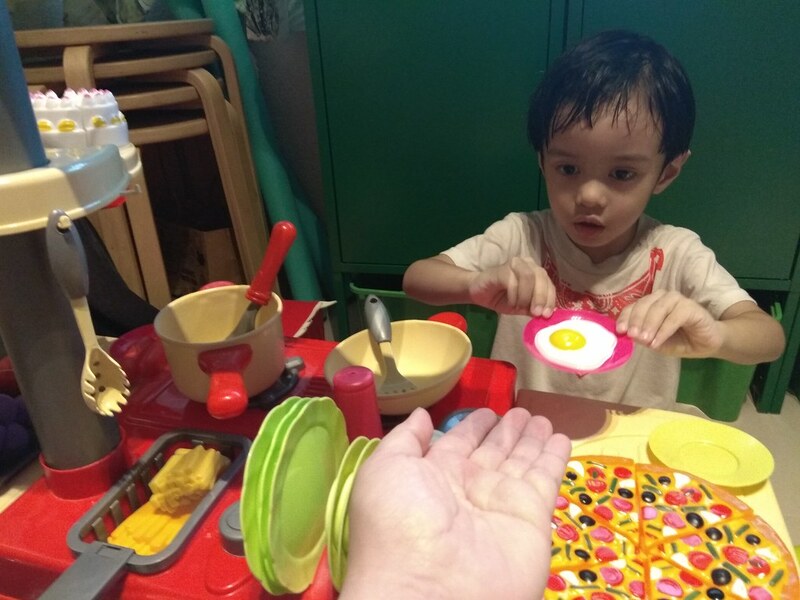 At first, he felt uneasy touching the wet vegetables (new texture) and used daddy's hands to hold the vegetables and print instead. 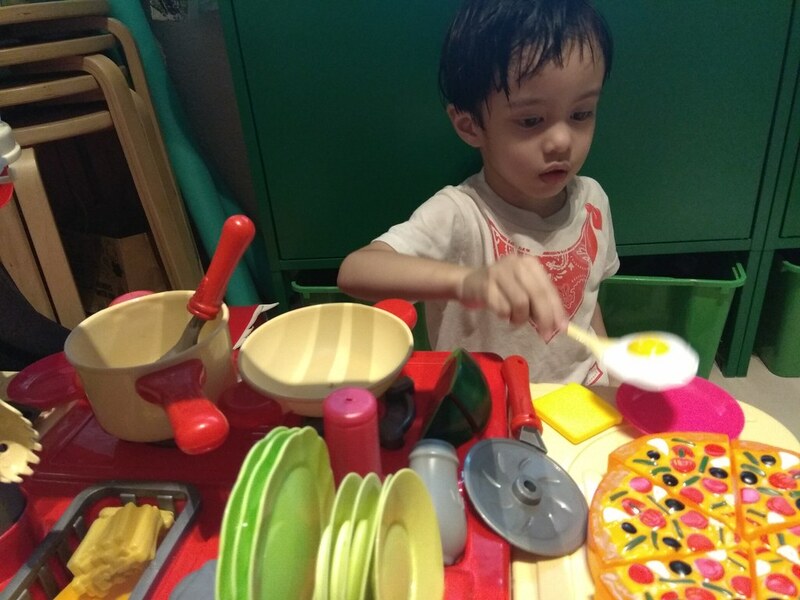 But soon, he was able to hold the vegetables himself and complete his artwork. Good job Arif!